Where do I get 3 months trial member of Signature Market? You may ask us thru Facebook, email or live chat, our customer service will assist you further. Do I need to be a member before I order? No, you don't need one. As a member, you can enjoy benefit such as further discounts, free gifts & etc. You can try it for 3 months FREE!! I signed up before, but why can’t I log into my account? Membership are only created when you purchase form us for the first time. If you haven't purchase before, you have just drop your email with us. We will remind you regularly with different promotion for your first purchase. What is the benefits of being a member? Will Signature Market systems automatically charges me when my membership expire? The trial membership will not auto charge you when expire. We accept credit card, debit card, online banking and e-Wallet. Can I change my order or add on/remove items once it’s placed? Once your order has been confirmed, it is not possible for us, to change. Please double check your orders at the check out page. I gave you a wrong mailing address or phone number. Can I amend the order details? Yes, but please do let us know ASAP. Once our team start to process your order, no changes is allowed. How am I sure my order is placed successfully? You will receive a confirmation email from us once your payment is successfull. Please double check to make sure the email does not end up in your junk/spam mailbox. How to get my invoice or receipt? We offer an affordable flat rate of RM 10 for all standard shipping. 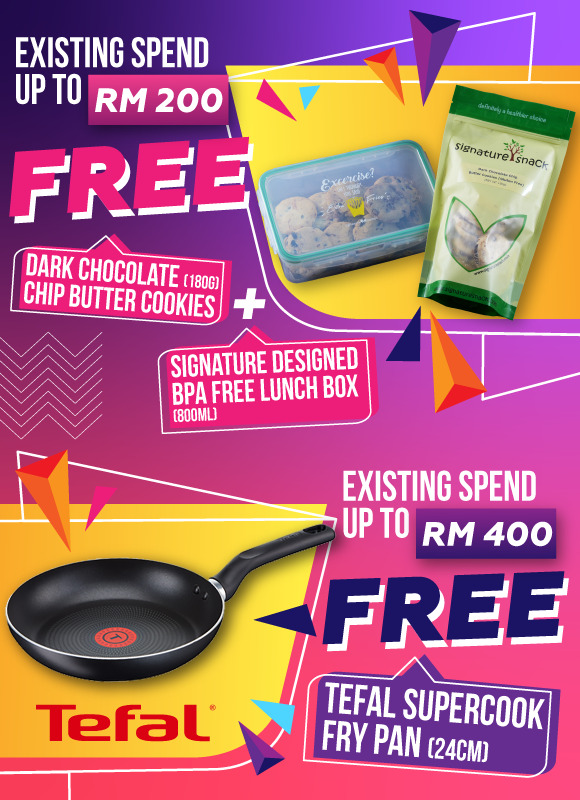 You can get a free delivery if you purchase RM100 and above. What type of courier service that Signature Market use? Delivery will be through our designated service partners which are Ninja Van, DHL (e-commerce), CJ Century and Pos Laju. Our system will auto assign to a courier deliver for you to pick based on the address you key in for your order. Where can I find my order tracking number? Your tracking number can be found at your email inbox or sometimes it may enter eg. Spam mail, Junk Mail etc. Login into your account. Click onto the top right-hand side (Your name). There you will see “Delivery History”. The tracking number can be found under (Tracking code)*. I have received my tracking number, but how can I check it? How long I need to wait after I received the tracking number? As a guideline, all orders will be processed the next or third working day on the day you place order. Once our team start to process your order, you will receive an email with your tracking number. From there, the delivery will take around 7-10 working days*, include baking and packing timing. Our team will pack the order accordingly based on first come first served basis. Most of our products is freshly baked hence it is worth the wait. *During peak sale/promotional period, we may not be able to fulfill the standard deliveries time period due to heavy surges in online orders – you will be advised of any product availability issues after placing your order. There will be an additional 3 working days to deliver. How long will it take to receive my parcel once the parcel has been posted out? Normally you will receive it on 2-3 working days* for Peninsular. For East Malaysia, you will receive it in 3-4 working days*. You may check on the delivery status from time to time using the tracking number. Should I include my phone number when ordering? Please ensure that a valid contact telephone number is added to all placed orders, do double check on your details before checking out. As all information given by customers are straight away pass on to the courier company. The courier company may call you in case of any difficulty finding your address. Failure in providing an accurate phone number could result in delay in delivery of your parcel. What should I do my parcel have been returned? Signature Market will check through parcels that has been return to us with the respective courier and will send out an email to the respective customer parcel that has been return. Kindly check on your email if your parcel has been returned Or you may email to help@signaturesnack.com Our customer support will assist you on the next step. Can I ask the courier service to deliver at a specific time or date? We regret to inform you that we are unable to schedule deliveries at specific time or date. Delivery times are influenced by your delivery destination and the courier service’s delivery schedule at your location. Our postage is standardized for whole Malaysia include East Malaysia only. We are unable to ship to any International address. We do not deliver to a PO Box address. I have multiple address to deliver to, how do I go about it? We are currently only able to deliver to one delivery address per order. If you'd like to deliver to multiple addresses, please place a separate order for each unique address. Can I consume Raw Nuts – Not Roasted (Almond, Walnut, Brazil Nut, Cashew Nut, Pecan, Peanut, Macadamia) directly? We advise is best to bake or roast them over the pan or oven before consuming it as it brings out the nutty and crunchiness texture of the nuts. Yes, they are. That is why they taste fresh as well crunchy. 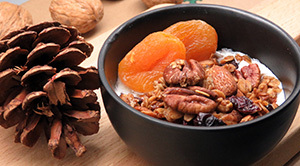 You may sprinkle over your overnight oats, salads or you may eat them straight away as a snack. How do I bake the nuts if I purchased Raw Nuts which are not roasted? How to know if the nuts are roasted well? Walnut, Cashew, Peanuts : Remove from oven once they changed into pale golden / slightly brown colour. Almond : Cut an almond into half to check. If the code turn to pale golden or slight brown then it is done. What is the best way to store my snacks? Opened Snacks : store in an air tight container at room temperature. Unopened Snacks : store at room temperature, away from sunlight and heat. Raw Ingredients : store in fridge. Organic products are fragile. Do you have a physical shop that I can walk-in? Sorry, we do not have any retail shops. All of our products is sold online. Can I pick up my order at Signature Market office? Sorry, pick up service is not available. We do not have cash on delivery service. I have a question that is not listed in the FAQ, what do I do? Please email us at help@signaturesnack.com. Please allow 24-48 hours (not including public holidays and weekends) for us to get back to you. Our working hours is Monday – Friday: 10am – 6pm. Does Signature Market have a Halal Cert or Jakim? We don't have a Halal Certificate or Jakim yet. However, all of our products are alcohol free and pork free. I want to purchase it as a gift for my family and friends and would like to add a greeting card. How do I go about it? At the checkout page, checked "This order as a Gift". Select your preferable greeting cards and add your greetings. What should I do, if my purchased order items are missing, damaged or wrongly packed? Please drop us an email: help@signaturesnack.com with your order number/delivery order number and a picture of the received items. Our customer service will assist you.